Hello! It's that time of the month again, in which the bloggers that are in my Paint All the Nails group come together and link up with nail art. Previous posts can be found under this tag. The theme for this month is Pastel Geometric. Ever since I reviewed Paint Box Polish's Ciao, Gelato! Collection, I have had them sitting on my desk, waiting to be used in a nail art design and I thought they would be perfect to use for this prompt. Initially I thought of possibly doing stamped decals but I haven't had luck yet with that technique so I went another route and did this stamped marble instead. If you need a tutorial of how to do that, Emily of Very Emily has an awesome video of this in her Bundle Monster Mochi Stamper review. I started out with a blank white base, using Pretty Serious Absence. Then I applied about four strips of striping tape randomly crossed on my nail. Once that was done, I took a stamper and dabbed blobs of polish and then pressed the stamper onto my nail. The colors I used are Paint Box Polish Ananas, Fragola, Fruit de Bosco, Melone, Pistacchio, and Puffo. I really like the final result. The colors have a muted watercolor effect and the white lines are a nice soft contrast. I did have a bit of bubbling, which annoys me to no end but otherwise, this was an easy technique, if a little time consuming. Make sure to click on the links below to see all the other bloggers' posts, I love how pretty and springy everyone's nails look! I love this mani! I'm so sad at stamping, but I might give this technique a try. Thank you Pam! This is so easy to do, you can totally handle it. Literally all you do smoosh the colors from the stamp onto you nail. Love the look of these nails so much. Thanks Jenny! I agree, it was so interesting to see how we were similar but not. They are adorable Ida. I love that you used yellow, it gives a nice (but subtle) pop of color. Thank you Paulina! I love the yellow too, it's gives it a more rainbow look to me. ooh, I love the background artwork you've done here! They looks like pretty little artworks that should be on my bedroom walls... (not in a creepy kind of way) Nice to see the striping tape use over the top, I love striping tape! haha I would like to have it on my walls too! It looks life fluffy colorful clouds? These are super gorgeous!! 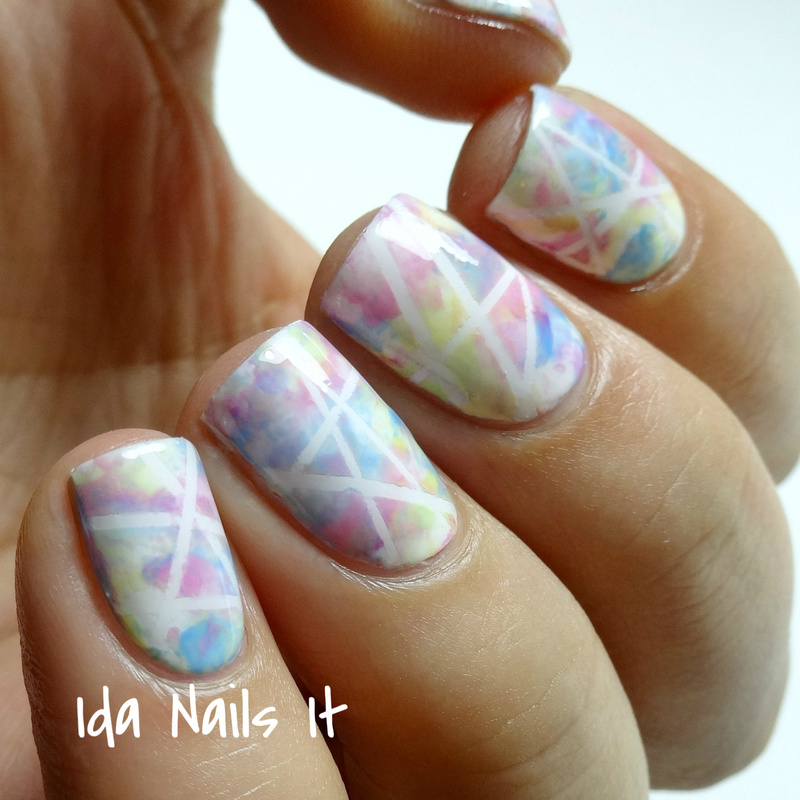 I always love a stamping marble, they are so much fun and always look incredible to me! Really digging the watercolour effect! And thank you so much for the link Ida!! Oh of course Emily! You always provide me with inspiration galore. Thank you! Oh thanks lady! If only I could arrange to send you decals, but trust me you don't want my sad looking decals lol. Great minds think alike! I have to admit, I like your stamping marble better than mine! It's sooooo gorgeous! Ahhh so pretty!! So delicate and sweet, I think you've given me a reason to try striping tape again! 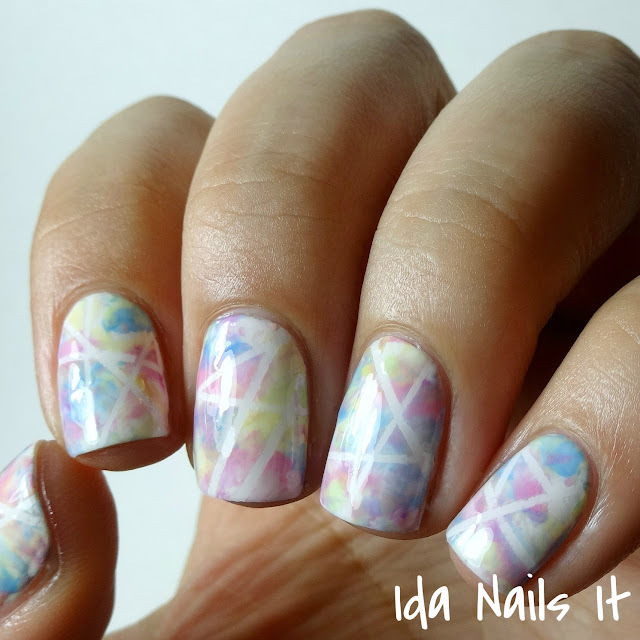 Gorgeous all over, stamping marbles over vinyls and striping tape give such gorgeous results! Your marble looks sooo pretty Ida! I love the thickness of the lines in contrast too!